To understand Aztec art history, we need to ask where the art came from and how it developed over time. Actually, these aren't easy questions to come from when we're talking about the peoples of the Aztec empire. Art developed in a different way that it did in other civilizations. Perhaps it will help to think about what came before the Aztecs, and what might have followed if their civilization had survived. The artistic styles that became popular had been developing for hundreds and thousands of years. Some elements of Aztec art came from the peoples at the heart of the empire (such as the Mexicas), and some came from the peoples that they conquered. As an empire that was quickly expanding and conquering, there may have been little time to develop new art forms. The excitement came from the new materials and discoveries that became available as the area of influence expanded. Had the civilization survived a few hundred years more, perhaps art would have developed more. 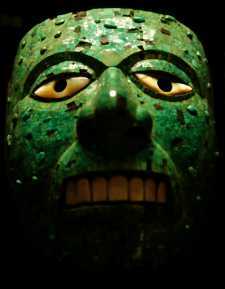 As it is, it's hard to develop a good history of art in the Aztec world, because the changes over time were very minimal. Sometimes pottery or recorded history that is discovered around the art piece is what archaeologists use to date it. There is another place art forms may have come from, and that is the Mixtec people. Never conquered by the Aztecs, these people maintained a vibrant culture which seems to have influenced their neighbours. Aztec art history is really more of a history of adapting the art forms that were already there. The nobles and religious leaders controlled a lot of the art that survives today. Temples and palaces were richly adorned - the carved thrones of rulers, the terrifying gods wearing the skins of humans and animals. 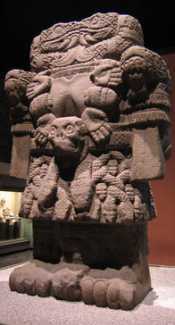 The statue to the right is Coatlicue, the Aztec goddess. What was ancient Aztec art like?